Hello, My name is David from Two Coins Entertainment. I'm a artist and have been developing mobile games using Unity3D along with a coder and we're able to produce some fun titles for PC and Mobile, however, we lack the knowledge to produce games for the NES. We are looking to develop at first a small test level of a game concept that we have planned out and then expand to build a full fledged game. After wandering through reddit and several other pages we stumbled this amazing forum full of talented people, we've been looking at it for a while and now decided to pose. The game is asidescroller with simple Double Dragon like combat system and movement ( with some elements of River City Ranoms ) . All graphics have been and will be prepared by us we simply need the game programmed in 6502 and able to work in an NES cartridge / emulator. We're looking to hire a programmer who is capable of doing this on a contract. If you have any questions feel free to ask! We can be contacted here via PM , admin (at) twocoins (dot ) net , and through skype at TwoCoinsEntertainment . If this is wrong section I apologize in advance! Just first things first, someone is going to point out that a lot of the graphics will have to be modified to respect attribute table restrictions, sprites per scanline limitations, number of colors per tile, and color choice (choosing from the NES's palette). If you haven't already, I would strongly familiarize yourself with the NES's restrictions and library of examples to make it easier to create art for it. I see six unique colors on your character. It is not impossible to create this using two sets of overlaid sprites (a la Mario is Missing for NES) but that will quickly eat into your sprite limit which is already a huge issue for beat-em-up games that have multiple characters on one line at a time. Plus, that's already two palettes used out of the four sprite ones available. I'd like to work with you on this, but I have no idea how to set up the contracts and all that. Send me PM for details. Let me know if you are interested in any audio or NES graphics work. Stupid question, but does the NES have those colors available in the first place? Also looking at that makes me wonder if it's really worth doing the overlaying, the face without overlay already looks pretty good in my opinion, and I bet the shirt could be easily adjusted if needed. Driving home Sik's question even more: the question "does the NES even have these colours?" is valid, and should be followed by "if so, are the colours you're using actually decent-looking on an actual NES vs. an emulator?" Things do tend to look a bit different on an actual television (NTSC known for being called "never the same colour" for a reason), but more importantly some of those colours might not actually visually "mix" well on an actual screen (i.e. 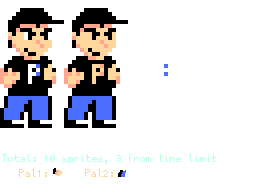 they might look fine in an emulator with a specific palette but might look like an ugly mess on actual hardware). So it's (at least) the 8th time someone asks to hire a programmer, but as far I know, all the previous times, nobody was ever "hired". (or it was keep ultra-secret). The last time I already made a cynical comment like this one, and the author replied "no, no I am very serious and really willing to hire someone". Yet I am pretty sure he didn't hire anyone eventually. Because of these precedents, I am extremely doubtful on your actual willingness to hire someone. Also, your image is too wide for the page. as far I know, all the previous times, nobody was ever "hired". Well, just because something never happened before that doesn't mean it can't ever happen. The biggest problem I see is that NES coders barely have time to work on their own stuff, so they can't really commit to working for someone else. The second problem I see is that people who are trying to hire coders often underestimate the amount of work that goes into creating something for the NES, and probably give up when they realize how much it'd actually cost. I believe that for an arrangement like this to really work, the coder would have to be a little more involved with the project, so that some of the work would be done out of passion, rather than it being just about the money. @Bregalad : My company is Two Coins Entertainment ( mobile game maker on google play ) , and I have hired somebody from this forum to work on the game! So you have a success story hopefully Bregalad. Just to be aware, I don't under appreciate coders, I pay obviously in the "xxxx" amounts for their time to create something that works and is tangible. We have a graphic artist who is currently on the project we will see how well they do in the next two weeks - but if I do require a better / working artist I will certainly update this thread again. I will also create a progress thread if you're all interested! I will also create a progress thread if you're all interested! Yeah that too, the two skin colors are so close that it may be bordering on being potentially a waste. Makes sense when your palette has 15 colors, but when it only has 3 and few palettes it becomes an issue in my opinion. Yes I had a very good applicant with some credentials apply, although in the future we may be developing multiple titles at once if this one goes well so I'm always interested in meeting more people in the development community!